The final project report is available to download. Comments are welcome – post a comment on the blog. Discussions with IRRI gave some simple assumptions which can be used when assessing the impact of biochar addition on the soil. If biochar analysis is available, then the impact of a known volume of biochar to soil can be calculated. For example, if one square metre of soil is amended with 4 kg of biochar (this is a 40 t/ha application rate), then we can assume that this represents 4% of the soil weight. This is because in 1 m at a 10 cm depth there is 100 litres of soil with an approximate bulk density of 1, which is 100 kg of soil. The properties of the biochar can then be assumed to be diluted in the soil at a 4% rate. 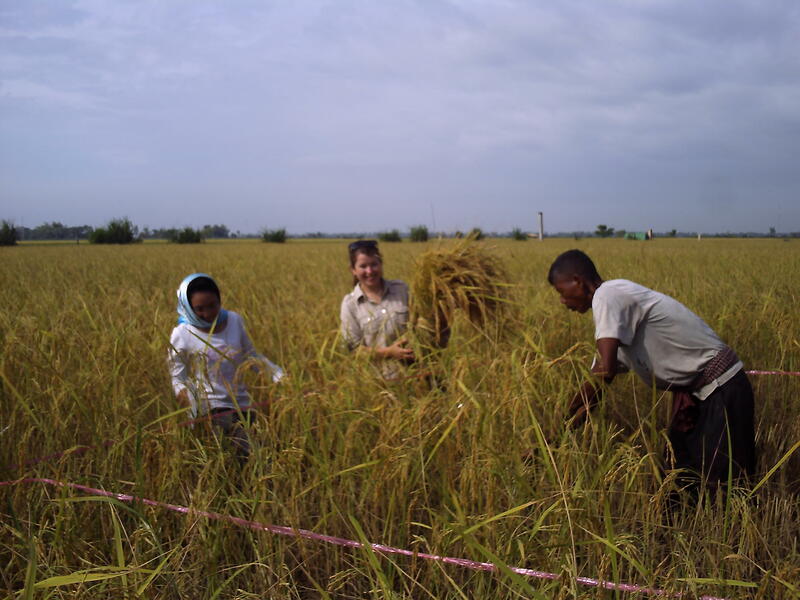 This assumption was then applied to the CEC (Cation Exchange Capacity) where rice husk biochar is added to the research farm soil in Siem Reap, Cambodia. Biochar has a CEC of 44.5 cmol+/kg. This is a rough assumption, and should not substitute using actual data, and it assumes that there are no interactions between the soil and the biochar which could influence the CEC of the soil. Although this won’t be the end of blog posts yet, we held the end of project meeting in Siem Reap 26-27.11.2010. The aim of this meeting was to put together the end of project document, to discuss findings, and identify further areas for research. The partners from all participating countries attended: ARTI (India), IRRI (Philippines) and University of Edinburgh (representing Cambodia). – More work on the potential of biochar production from rice straw (there is relatively more work on rice husk biochar). We are actively seeking funding to ensure that biochar research is comprehensive in that covers all potentially useful functions of biochar, and also is able to answer some of the unknowns in order to reduce risk of biochar application and production. Dr Karve and Mr Prabunhe from ARTI (Appropriate Rural Technology Institute – India) assisted with harvesting the rice on the last of the trial plots in Chireve Commune, near Siem Reap town. The same trial design, and same treatments was used as the Nagathom farmers, and this farmer also used the same variety of seed – one of the reasons for selecting this farmer. This farm was planted over a month later however than the Nagathom farmers, and yields were significantly lower an average yield of 0.32 t/ha of paddy and 0.71 t/ha of rice straw. There was some rat damage reported by the farmer, and the height of the rice was noticeably lower (which also made it easier to harvest!). 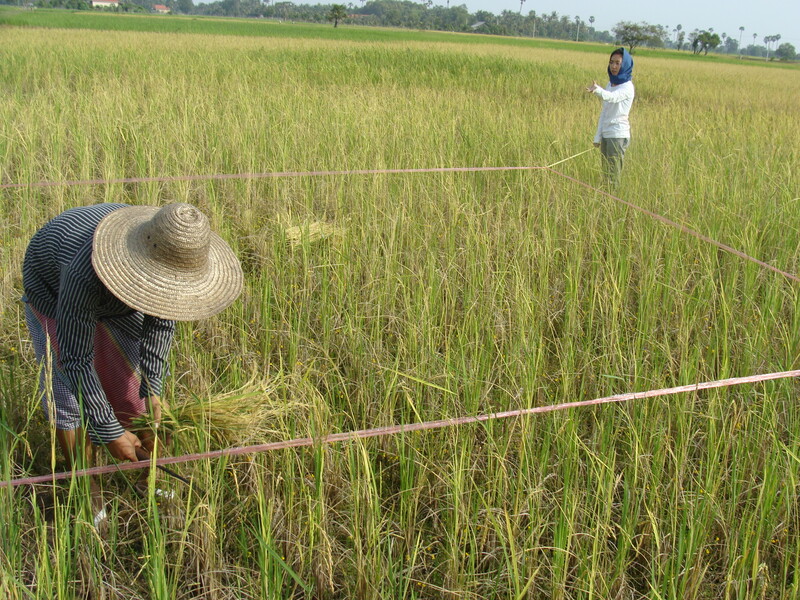 The picture shows the string which is measured to include only the part of the plot which is to be harvested for the data collection. 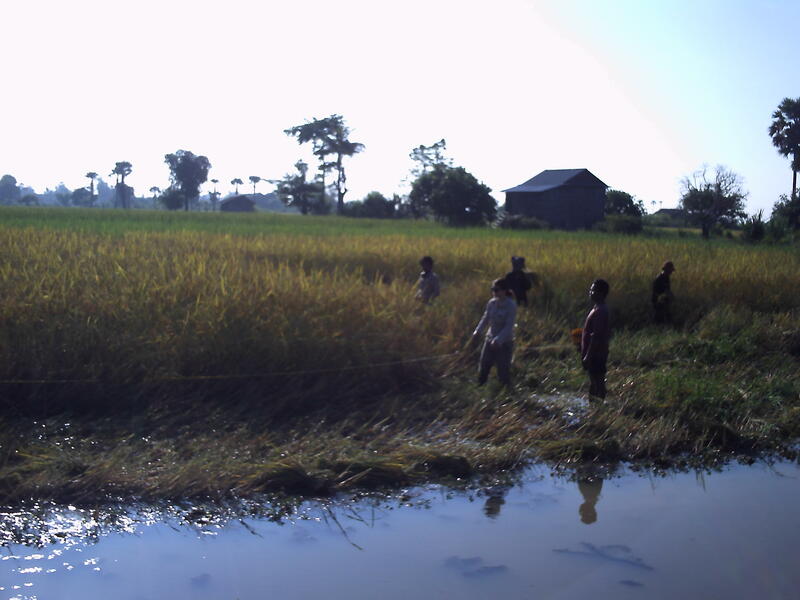 The farmer can then harvest the remaining rice in the field – we compensate farmers for this inconvenience. Harvesting in Chireve - within the plot boundaries. Photo by Mr Prabhune. Some useful comments were made by the ARTI team, who suggested that simple management changes could lead to higher yields. The main comment, was that the rice was harvested early, and another 15 days would likely see higher yields. However the farmer may have been reluctant to do this since surrounding farmers were harvesting and leaving the rice in the field would lead to it being susceptible to further damage from pests. The method of threshing was also discussed. The farmers use a traditional method when the rice is wet – using their feet to pound the rice straw to break off the paddy. 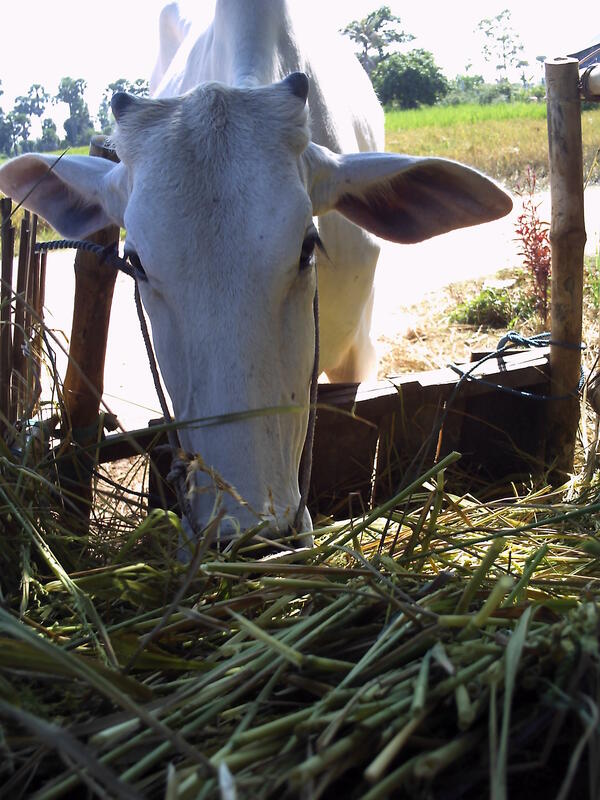 This led to some of the paddy being still left on the straw – which is subsequently used as fodder so not wasted, but does mean that the potential revenue for the harvest or amount for human consumption is reduced. When the rice straw and paddy is drier, it is beaten with a stick to remove the paddy which may be more effective. Threshing rice, Chireve 25.11.2010. Photo by P. Karve. Rice was harvested on two Nagathom outgrower farmers, who grow Phka Rumduol rice variety. These farmers were in Sasadom Commune which is near the Nagahtom rice mill. The variety is an improved seed, and is provided by the Nagathom Fund. Having an improved variety is useful for the trials since it is more consistent than local saved seed. The harvests across all the plots (3 replicates in each treatment – biochar 41.1 t/ha and control with no biochar), gave an average yield of 2.03 t ha of paddy and 2.42 t/ha of rice straw. In all cases the average was higher in the biochar amended plots – the results will be available in the project report which will be available early next year. Rice harvest Nagathom farm 2. 20.11.2010. Photo by Mr Tan. Proceedings from the e-workshop are now available in the output document. Is there enough rice husk to make biochar? As a follow on from the previous post, as mentioned many mills have piles of rice husk left from their activities, which is not being used at present. Discussions with Dr Tan Boun Suy from the Apsara Authority, led us to consider the following question – if biochar is to be promoted as a useful soil amendment (for example at 20t/ha application for rice fields), is there enough? 2t/ha paddy produced, 0.4 t/ha husk, 0.13t/ha biochar per year. Therefore in 150 years, enough biochar would be produced for a 20t/ha application rate. Of course if biochar can increase harvest, then this would lead to more biochar availability!! Is there any ‘waste biomass’ in a rice system? Last week, we had a practice run harvesting rice in trial plot formation. It is essential to ensure that each plot harvested is the same size (for example the same border is left to account for the border effect in each plot), and that the area harvest matches exactly with the area where the biochar was applied (not so easy when the plots are in 1.5 feet of water! 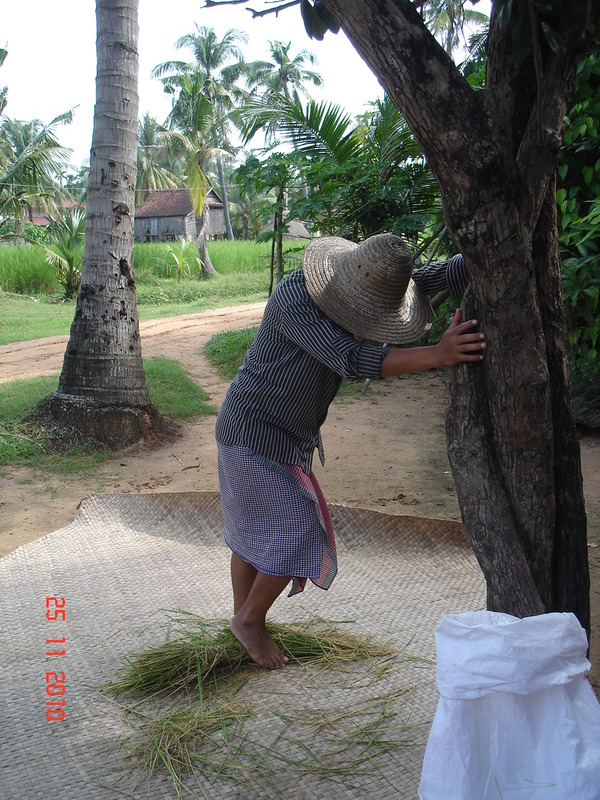 The harvested straw with rice was then weighed, then the rice thrashed (in this case using the traditional method involving stamping on the harvested straw), and the paddy (rice with husk) weighed. After this the paddy is dried, and then milled to remove the husk. Other processes such as polishing the rice, or colour sorting can be done in more high technology mills. So what happens to the ‘waste biomass’ (and is there even such a thing as waste biomass in this system)? In this case there is no biomass which is either left to rot, or burned for no purpose. However where rice is taken to other mills, the husk is often left in large piles, and where this is not all used for gasification, we can call it ‘waste’. A total of 78 participants registered for the E-workshop last week – Biochar; the potential in Asia Pacific. The discussion was lively and wide ranging, with lots of input from practitioners within the region. A summary will be available shortly. “It is interesting to see the potential for biochar production in the USA although the scale of this is probably relatively insignificant. The production of charcoal is not large in developed countries compared to other fuels, for example in the UK it is 5000 tones per year. Assuming that 80% is C, then that is 0.8 x 5000 = 4000 tonnes C. That compares with an annual emission of c. 165 MTC or 0.0024%. However we do see this technology as having particular relevance, and at a much larger scale in developing countries. Biomass is used as a fuel (for cooking or heating) by over 2.4bn people, the majority in developing regions. One other issue which is confusing in this article is the comparison of the heat from the production of biochar with burning charcoal, which is likely to be very different – burning the biochar its self is a more comparable heat source. * Stoves can use waste biomass, which can not be burned well in many traditional stove designs.